Free and open to anyone interested in The Gasp; potential riders, sponsors, or contributors. It's The Last Gasp-with a new spin! Join us for an information session to learn why it’s time for you to consider rolling with The Gasp! 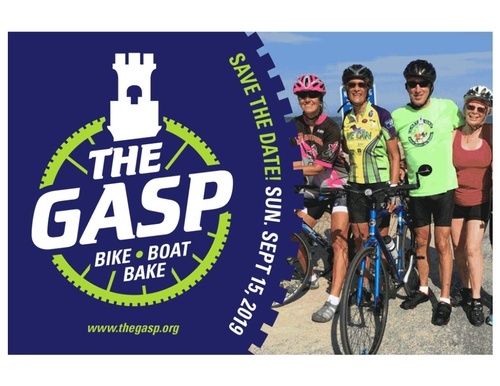 The Gasp: Bike, Boat and Bake is now entering its 28th year with a brand new look! for the Cape Cod Community as well as one of the best days ever for our participants. This 62 mile ride features a trip from Sandwich to Provincetown on your bike with an all new route to maximize your riding comfort and safety! After you finish in Provincetown, enjoy lunch and a shower at the finish line before you hop on a trolley to get to the boat and return to Sandwich where you can pick up your bike and head to a well deserved lobster bake!